5.3 Earthquake hits the southwest Indian Ridge. Sakurajima (Kyushu, Japan): After a calm week during 12-20 April, the volcano is back with its typical average of 1-2 daily vulcanian explosions. Ash plumes have ranged from reaching 5-10,000 ft (1.5-3 km) altitude. Batu Tara (Sunda Islands, Indonesia): The volcano seems to have entered a stronger phase of eruptions during the past days. A series of ash plumes from explosions were detected on satellite imagery since 26 April. The estimated altitude of the ash plumes is 8-10,000 ft (2.4-3 km) (VAAC Darwin). Sinabung (Sumatra, Indonesia): The volcano continues to slowly aliment the large viscous lava lobe on the SE flank. Its growth is mainly manifested by numerous small to medium-sized rockfalls from its flanks and front, but also occasional pyroclastic flows that have reappeared since mid April. These new(, but much smaller than those earlier this year) pyroclastic flows have been triggered by comparably larger collapses that originated from the upper part of the lobe. The reason for the new pyroclastic flows might be that most arriving new lava, rather than contributing to the growth of the lobe as a whole, which is now a large and stiff mass difficult to move, now accumulates near the vent and starts to form a new lobe on top or at the side of the existing one. As the slope in the upper areas is steeper, it is easier for new lava masses to collapse into more energetic avalanches, i.e. pyroclastic flows. Dukono (Halmahera): Ash plumes from (probably strong strombolian) explosions continue to be spotted on a more or less daily basis, suggesting that activity remains high. Ahyi (United States, Mariana Islands): USGS raised the alert level for the submarine volcano due to abnormal seismicity detected in the area by hydroacoustic devices and land-based network devices on neighboring islands. However, the latter are relatively distant, such as Pagan located 270 km south. The source of the unusual signals that appreaed on 24 April can only be located approximately, and could originate from other seamounts near Ahyi volcano. For the time being, no other indications of possible volcanic submarine activity have been detected. Popocatépetl (Central Mexico): Activity at the volcano remains low and essentially unchanged. The frequency of small steam-gas emissions was less than one per hour yesterday. Weak incandescence continues to be visible at the summit at night. Santa María / Santiaguito (Guatemala): Activity remains relatively low and unchanged. Occasional explosions from the lava dome produce small ash plumes generally lower than 1 km. Only few avalanches were reported lately, suggesting that effusion rate has dropped. Fuego (Guatemala): Activity has remained at normal, but relatively high levels, characterized by intermittent small to moderately strong strombolian explosions at intervals ranging from 10 minutes to more than 1 hour. The strongest explosions eject abundant glowing material to 150 m above the crater and ash plumes up to near 1 km, and are usually accompanied by shock waves felt in several km radius. San Miguel (El Salvador): The Chaparrastique volcano remains restless. An increase in degassing and seismic activity on Sunday was reported. According to a local press article, MARN observed pulsating gas emissions that reached heights between 200 and 600 meters between 9-11 pm yesterday local time as well after midnight. Reventador (Ecuador): The volcano’s activity remains moderate to high, with continuing sporadic explosions. Cloud cover has prevented direct observations most of the time. Tungurahua (Ecuador): Activity of the volcano remains comparably low, with only few and weak emissions of low energy. A number of lahars, caused by heavy rains remobilizing loose deposits, occurred in the riverbeds of Ingapirca, La Rea, Achupashal and others streams on the S and SW sides. Ubinas (Peru): Activity has decreased since 23 April: less and generally smaller explosions have occurred since, with a possible pause during 23-25 April when webcam images show no plume during daytime. However, during that time the volcano continued to produce an abundant degassing plume that sometimes contained some ash. Typhoon (TY) 06w (Tapah), is located approximately 151 nm northeast of Saipan, and is tracking northward at 08 knots. 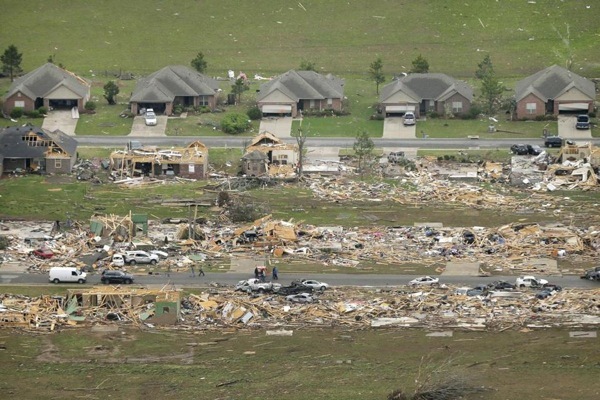 USA – The death toll in the first major US tornado outbreak of 2014 has claimed the lives of at least 21 people. Dozen of tornadoes have been reported in Franklin, Davis, Monroe, Linn, York, Polk and Lee counties. At least sixteen people died in suburbs of Little Rock, the state capital and largest city in Arkansas. A state of emergency has been declared in Georgia. 5.6 Earthquake hits the Babuyan Islands region, Philippines. 5.1 Earthquake hits the Lake Baikal region, Russia. 5.1 Earthquake hits the Bougainville Islands, Papua New Guinea. 5.1 Earthquake hits northern Qinghai, China. 5.1 Earthquake hits Kepulauan Tanimbar, Indonesia. 5.0 Earthquake hits Papua Indonesia. Tropical depression Six is located approximately 144 nm southeast of Andersen Air Force Base, Guam. New Zealand – Cyclone Ita devastated West Coast forests. The totara forests on New Zealand’s west coast appear to have taken the biggest hit from Cyclone Ita, with several parts of forests completely flattened. The full scale of the destruction Ita wrought upon the West Coast’s native bush and tree population may not be known for weeks. 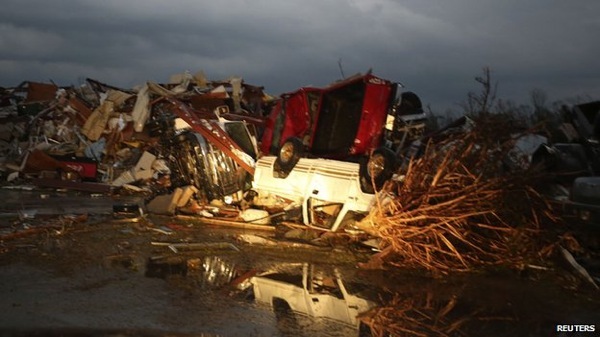 USA – Tornadoes ripped through the south-central United States on Sunday, killing at least 17 people in Arkansas and Oklahoma and wiping out entire neighbourhoods, authorities said as rescue workers searched in darkness for survivors. Sixteen of the victims were in several suburbs of Little Rock in Arkansas, officials said. Arkansas authorities said at least 10 people had died in Faulkner and six more across the state – the first reported fatalities of this year’s tornado season. Another person was killed in neighbouring Oklahoma. “An entire neighbourhood of 50 or so homes has been destroyed. Many homes are completely gone except the foundation … There is more devastation like this in other parts of Arkansas,” state congressman Tim Griffin told Reuters. Cable television’s Weather Channel showed videotape of mangled, overturned cars, some with people still inside, lining miles of Interstate 40 near Mayflower, 22 miles northwest of state capital Little Rock. A tornado hit the east side of Mayflower at around 7.30 pm, killing at least one person, tearing up trees and bringing down power lines, making it difficult for the emergency services to find stricken areas in the dark. USGS raised the alert level for the submarine volcano due to abnormal seismicity detected in the area by hydroacoustic devices and land-based network devices on neighboring islands. However, the latter are relatively distant, such as Pagan located 270 km south. The source of the unusual signals that appreaed on 24 April can only be located approximately, and could originate from other seamounts near Ahyi volcano. For the time being, no other indications of possible volcanic submarine activity have been detected. 5.7 Earthquake hits the Pacific-Antarctic Ridge. USA – Residents, meteorologists and emergency officials in eastern North Carolina were surveying the damage Saturday from multiple tornadoes that damaged more than 200 homes the previous day and sent more than a dozen people to the emergency room. The National Weather Service said Saturday that it confirmed an EF-3 tornado touched down in Beaufort County with winds estimated at 150 mph. It’s the latest in the season that an EF-3 tornado or stronger has been recorded since records going back to 1950. 5.1 Earthquake hits the Greenland Sea. Flash floods after heavy rains in northern Afghanistan killed at least 75 people and damaged thousands of homes, leaving authorities scrambling to help survivors in the remote region, officials said. The rains began late Thursday and continued into Friday in four provinces. The worst affected appeared to be Jawzjan, where at least 36 people were killed, according to police spokesman Abdul Manan Raoufi. Other officials put the death toll there at 43. Azizul Rahman Aymaq, who heads the disaster relief committee in Jawzjan, said more than 5,000 people have been displaced, and medicine and drinking water are running short. Afghan army helicopters are helping rescuers reach the affected areas, he said. In Faryam province west of Jawzjan, the floods killed 33 people, damaged more than 2,150 homes and caused widespread damage to farmland. Another six people were killed in Badghis province. Suri Pul province was also affected by the flooding. Latest reports put the death toll at over 100. A forest fire was reported around 11 a.m. in Wharton State Forest in Shamong Township, Burlington County. It burned 50 acres within a half hour, and was expected to char at least 200 acres before being contained. No injuries and only minor property damage had been reported from a quartet of fires that broke out on Thursday, fanned by strong gusty winds. But by Friday morning, those winds had died down considerably, and a steady rain forecast for late Friday into Saturday was expected to drastically shrink the fires if not extinguish them completely. A blaze in Berkeley Township that burned more than 300 acres and forced hundreds of evacuations was fully contained Friday morning,. Residents were allowed to return to their homes late Thursday. A smaller fire in a different part of Berkeley had burned 220 acres and was 40 percent contained as of Friday. A fire that burned more than 1,500 acres in Downe Township in Cumberland County, at the far southern end of the state, was declared under control Friday morning. That fire, in the Bevans Wildlife Management Area, was far from homes or other buildings. And a blaze that burned 569 acres in Franklin Township in Gloucester County was 50 percent contained. Several smaller brush fires also broke out around the state on Thursday, fed by the high winds but did not approach the size of the four largest ones. Winds were sustained at 20 to 25 mph, with gusts of 35 to 40 mph on Thursday. Combined with dry conditions in much of the state, the winds led state officials to ban outdoor fires Thursday. Dozens of firefighters battled the blazes on the ground. Bulldozers built walls to stop the spread of flames and several helicopters and firefighting planes dropped water on the fires. There was no initial indication of what touched off any of the blazes.